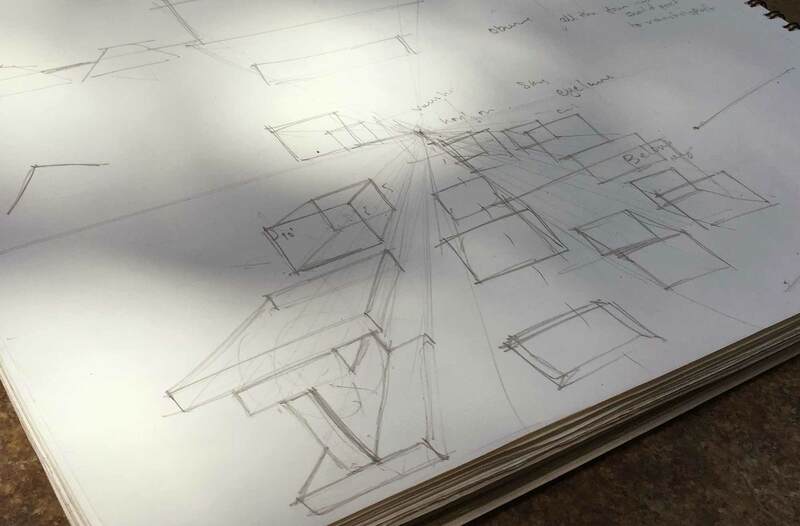 Home » Blog » Principles of Perspective Sketching: Fix your angles today! Perspective Sketching in art helps in imparting a three-dimensional effect when drawn on a two- dimensional surface. The involvement and usage of perspective in a composed painting or drawing imparts a realistic and believable appeal. In art it is often defined as the system of representing the way the objects nearer come close together while the farther ones are away in the diminishing manner. Perspective sketching involves three kinds of perspective drawing, one – point, two – point, three – point and atmospheric perspectives. Single point perspective is the simplest form of perspective representation as it involves single vanishing point. Here, the objects are placed in such a manner that the front sides are parallel to the picture plane with the side edges diminishing at a single point. The vertical and the horizontal lines in a one-point perspective run parallel with their vanishing points at infinity. One- point perspective is often used to represent the interior views in the drawing or painting. In the two-point perspective drawing the position of the viewer is such that he is able to see the object from one corner. In this case the verticals remain perpendicular while the two sets of horizontals diminish towards the vanishing point at the outer edges of the picture plane. The two-point perspectives are tough than the single point perspective as both the front and back edges as well as side edges must be diminishing at a vanishing point. It is often used in architectural landscapes. When the viewer’s observation is up or down with the verticals converging at the top or bottom of the image it is called three – point perspective. Atmospheric perspective is not a form of linear perspective rather uses the control of focus, contrast, color, shading etc, to recreate the observed object or scenery without losing the crisp and clarity of the object with the distant object less muted. Why Perspective Sketching is an important element? Perspective Sketching is an important element of art and architecture thus learning the perspective sketching can help the Architecture students and other building and art aspirants to understand the usage and importance with clarity. Sampratishta School of Fine Arts brings you an opportunity to learn the perspective sketching under 3 months module during the weekends in Bangalore. It is platform where you would be brushed with the most experienced artists to guide and enlighten you with the knowledge of perspective sketching for 3 months. So walk in with passion to learn and walk out with the knowledge gained with confidence.